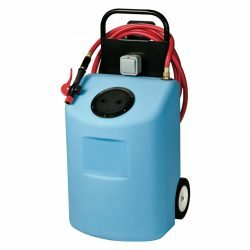 Complete the crucial maintenance task of watering lead-acid forklift batteries with the 20 Gallon AC-Powered Watering Cart (WC-HYDRO-20-KIT), which is perfect for mid to large size applications. Easily transport up to 20 gallons of water in this large tank from the water source to the batteries, and use the water gun to fill cells with precision. When not in use, the power cord is retractable into the rear-mounted reel, and the hose can be wrapped around the hooks to prevent damage.